Could UK's Italians rock referendum vote? Could the UK's Italian expats hold the key to their homeland's future? In cafes and workplaces all over the UK, you will hear Italians talking about food and football, but also about Italy's pivotal 4 December referendum on constitutional reform. More Italians are believed to have moved to the UK than any other European country in 2015; 600,000 are now estimated by the Italian consulate to live in the UK. More Italians live in London than any other city in the world, except Buenos Aires. They may play a key role in Italy's vote, and that is why leading Italian politicians have been flying to the UK to try to win expat votes. Italian Prime Minister Matteo Renzi says the reforms he's proposing are the best way for Italy to kick-start its economy - by streamlining decision-making and cutting red tape and public spending. But his critics say the changes will give him too much power and are a diversion from more urgent problems, such as corruption, unemployment and poor economic growth. The stakes are high. Mr Renzi says he will step down as prime minister if he loses the referendum, prompting the anti-government Five-Star Movement to characterise the referendum as a vote of no-confidence in his premiership. It could become the Italian equivalent of David Cameron's gamble on the Brexit referendum. If the prime minister does lose, there could be calls for a general election, which his supporters warn could plunge Italy into dangerous instability. In previous votes, less than a third of Italians abroad used their vote - so politicians have been trying to get the vote out. Registry of Italians Resident Abroad (AIRE). Mr Renzi sent his minister for reforms, Maria Elena Boschi, to London along with another five politicians from the Yes campaign (##BastaUnSiUK). 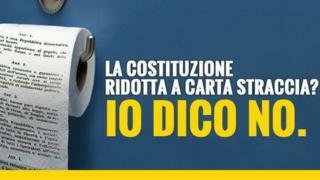 The No campaign (#IoDicoNo) is led by Italy's biggest opposition party, the Five-Star Movement. It flew over one of its senior representatives, Luigi Di Maio, along with three more speakers from the No campaign. What are the actual proposals? At the heart of the referendum are proposals to rewrite a third of the Italian constitution and reduce the size and power of the second chamber of parliament. At the moment the two houses - the Senate and the Chamber of Deputies - are just about equal. The referendum proposals would cut the number of senators from 315 to 100 and strip the Senate of the right to hold votes of no-confidence in the government. Reformists say this would cut the cost of politics by €500m (£430m; $530m) a year and speed up lawmaking by ending decades of parliamentary ping pong. Referendum text: Do you approve the text of the Constitutional Law on 'Provisions for exceeding the equal bicameralism, reducing the number of MPs, the containment of operating costs of the institutions, the suppression of the CNEL and the revision of Title V of Part II of the Constitution' approved by Parliament and published in the Official Gazette n° 88 of 15 April 2016? This wording is actually simpler than some previous referendums. Biggest campaign gaffe A Yes campaign mailout included a typo in the web address - www.bastausi.it instead of www.bastaunsi.it. No campaigners promptly bought the incorrect domain and linked it to their website. Giusy Balzano is a night worker in a fast food restaurant in central London. "Our constitution is beautiful," she explains, "so I will vote No in the referendum to protect it. Also, if No wins, Mr Renzi will go home and finally Italians will have new elections and then maybe things will change and I can go home." Giusy has lived in London for a year and attended one of the events "Diciamolo a tutti" (Let's tell everyone) organised by the Five-Star movement. Image caption Gianluca is voting Yes to stop his country being "a laughing stock"
Yes-campaign group "AperiSì" has been meeting weekly in London and eight other cities. They take their name from the Italian custom of "Aperitivo", a pre-dinner event popular among young people. One of the London organisers, Gianluca Failla - a 30-year-old social worker originally from Palermo - believes Mr Renzi's reforms will improve politics in Italy. "I studied International Relations in London, and I had to face ridicule each time I spoke about my country. I don't want this reputation any more. We are a laughing stock," he complains. He also thinks a Yes vote would help him personally. "It will be easier for Italy to approve laws to allow gay couples to adopt," he says. "Politicians avoid dealing with controversial legislation by letting the two chambers ping pong the law between them to delay a decision. I hope that finally this law can pass and I will feel like I have the same rights other Italians do." Make-up company employee Alessandra Ciarno, 33, is yet to decide how to vote. "I would like to be more informed about the referendum before making a choice," she explains. She has been living in London for nine years and fears a Yes vote could be bad for Italians abroad as there will be fewer senators to represent them. Ms Ciarno also sees the wording of the referendum question as an issue. "I believe many people will not understand what it means."